Piers Paul Read is something of an oddity in contemporary English fiction, in that he is probably best known for his non-fiction work, most notably Alive, the 1975 account of the aftermath of the Andes plane crash. His other non-fiction has varied between other chronicles of disaster, such as Ablaze, about the Chernobyl nuclear reactor failure, and studies of historical events, such as the Dreyfus affair. He has also written a biography of Alec Guinness, a history of the Knights Templar, screenplays, essays and criticism, as well as seventeen novels. One thread that runs strongly through the different aspects of his work is a robust traditional Catholicism, derived, one imagines, from his Benedictine schooling at Ampleforth. At 76, he is one of the grand old men of English letters, like Tom Stoppard, who was once a flatmate. 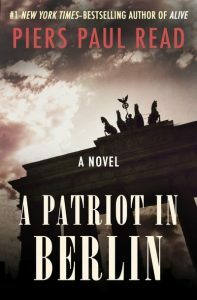 A Patriot in Berlin, first published in 1995, and now reissued as an e-book by Open Road Media, is a spy novel that begins as a thriller, and ends as a meditation on patriotism and loyalty. The scene is the newly unified city, shortly after the events of 1989. A pair of disreputable Russian smugglers are found brutally murdered, and the German police can make no progress. In Moscow, a former KGB agent, Orlov, has vanished, and the Russian secret service sees a connection between the Berlin murder and their man’s disappearance. A shabby functionary, Nikolai Gerasimov, is dispatched to liaise with the police, and to track down their agent. In another narrative thread, a young American art history professor, Francesca McDermott, arrives to see friends in Berlin from her student days, and is soon invited to curate a massive exhibition of Soviet art by Stefan Diederich, now Berlin’s minister of culture. These elements are artfully drawn together by Read into a fast-moving plot that switches cinematically between the streets of Berlin to those of Moscow, with some excursions to a former Soviet base in East Germany. Read is excellent at evoking the atmosphere of post-Wende Berlin. In particular, he renders the contrast between the capitalist west and the rapidly-changing, but still down-at-heel east with a keen eye for the telling detail. Similarly, his descriptions of quotidian life in the somewhat chaotic Moscow of Boris Yeltsin and his cronies ring true. It was a time when national, and therefore personal identities were under threat, and the novel goes well beyond the normal confines of the spy genre to examine the nature of patriotism and duty. The characters are much more rounded and fully-realised than the usual stereotypes of genre fiction, and their complex motivations are a key aspect of the way the plot develops. Having said that, the usual elements of espionage fiction are here: murder, deceit, sexual tension, a race against time, a satisfying dénouement and an unexpected final twist. The Europe portrayed in this novel from two decades ago has not, in the era of Putin, changed as much as one might imagine. Read’s subtle and thoughtful story stands up well. This is a good example of a literary novel that uses the tropes of genre fiction with delicacy and intelligence. Piers Paul Read: A Patriot in Berlin by Dr Rob Spence is licensed under a Creative Commons Attribution-ShareAlike 4.0 International License.